Perhaps you have heard Laurie Helmers sing, seen her act, noticed her name on programs from Spring Valley to Rochester and points west and south. She began by playing Daisy Mae in “Li’l Abner” in college. A voice and piano teacher, Helmers says her directing career kicked into gear when Stewartville Community Education wanted to do a musical and she took on the director role. One of her favorite productions is “Suite Surrender” at Rochester Civic Theatre. As director and actor, she says it was a perfect blend of actors, set and script. Always on the lookout for the next good script, she is open to different opportunities. Having performed and directed in many rural communities as well as Rochester, Suzie Hansen brings a wealth of experience to the newly formed Absolute Theatre as one of its founding members. “Going from acting to directing seemed like the natural thing to do. Being able to create the overall picture in your head is rewarding. You have access to every character and can influence the interpretation. Yes, lots of work and pressure bordering on craziness, but rewarding,” Hansen states. The musical “Robber Bridegroom” is much loved, and Hansen has directed it multiple times. She’s written numerous mysteries and performed for charities. Opening night, she says is “nerve racking,” but she tries to sit back and enjoy it. Talent behind the scenes and on the stage speaks for itself. Such is the case with Misha Johnson. After college, and a lengthy stint in a theatre company, she returned to her hometown of Rochester. Putting her musical, acting and directing talents and experience to good use in a variety of ways, she likes having her hands in all of it. “A director’s job is to bring theatre to life and life to the theatre,” Johnson states. Johnson has offered innovative programs for youth in Rochester and Denver, Colorado. She cites Rochester as a fertile ground with room to grow. Jean Skattum has directed for somewhere around 60 years. “Boy, I’ve seen a lot of changes in that time,” she explains. A theatre major in college, she often worked with the local community theatre in Winona. She gained experience as a high school teacher and drama director. “Carousel” was the first play Kathy Keech directed. “It was a big project my brother in Chatfield sort of coerced me into,” Keech admits. Theatre was her major in college and after graduation, she was busy with theatre in New York and the Guthrie in Minneapolis. When not offered a directing opportunity, she was more likely to be building sets. She also taught, acted and choreographed, which are more traditional roles for women in theatre. She returned to her home territory to work and raise a family. Taking an eight-year hiatus, she returned first to acting, then directing. One of her favorites plays is “Children of Eden,” while “Mamma Mia!” is on her bucket list. She will be directing “Blood Brothers,” an engaging but ambitious production at Absolute Theatre. “I never take directing for granted,” she adds. What began as a plan to become a commercial artist turned into a theatre degree after Joan Sween accepted a role as Joan of Arc in college. “I was seduced by the group of people who worked together and became a family. It was a lot more fun than standing in front of a canvas,” Sween recalls. Her directing debut was a murder mystery performed in the Saint Marys School of Nursing. She has directed and performed in several plays in numerous locations. “I enjoy seeing your personal interpretation of a script come to life,” she says. “If I have seen a play I want to direct, I aspire to do it better.” You can never do enough research or planning, she advises. A major issue is scheduling. Allotting enough rehearsal time with so many actors leading busy lives makes it a major challenge. “Miracle Worker” and “Inherit the Wind” remain two of her favorite directing experiences. Sween’s background includes being a successful costume company entrepreneur, business owner of Feast and Footlights Dinner Theatre in the Holiday Inn Downtown Rochester and the originator of a widely acclaimed national playwright contest. Now semi-retired from directing, Sween is a prolific playwright and artist. I was a learn-as-you-go director. Finding myself back in my hometown of Spring Valley after getting married, my love of theatre led me to found Brave Community Theatre. There weren’t many community theatres or female directors. My youth and inexperience made me blind to the odds of success. 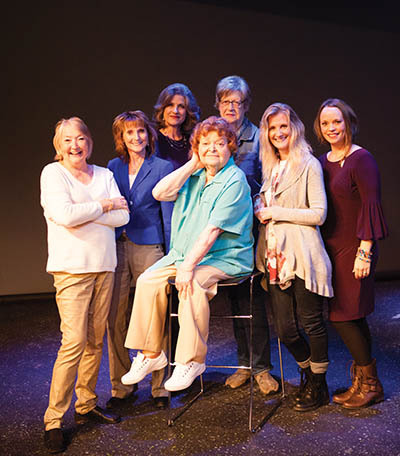 With the help of a dedicated “family” of actors, a supportive family at home, and despite the difficulties of space, money and time, Brave Community Theatre is finishing its 46th year. During that time, I have had the privilege of directing high school plays, working with other theatres in numerous capacities and having my original plays performed. Theatre is a major part of who I am. It can make reality more real, examine stereotypes, blend pop culture and politics with floodlights and enable us to laugh and cry and truly see ourselves. Directing is a marvelous journey with an exciting destination. Bravo to these directors and many others who continue on the path to another opening night! Debi Neville is a freelance writer of poetry, plays and stories. She lives in Rochester with husband, Pat.